The most current version of Nimble CROSSWIND rear hub was revised June 2000 (to model C2K). All rear CROSSWIND wheel sales as of June, 2000 already include this hub. The newest hub is now 94 grams lighter than the prior rear hub model. The new hub also eliminated 2/3 of the noise, making it almost silent, it offers greater lateral stiffness, and offers 1/2 the coasting drag. 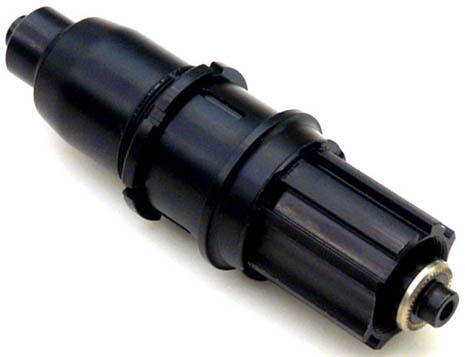 You can upgrade any prior to June 2000 CROSSWIND wheel (front or rear) with this hub. 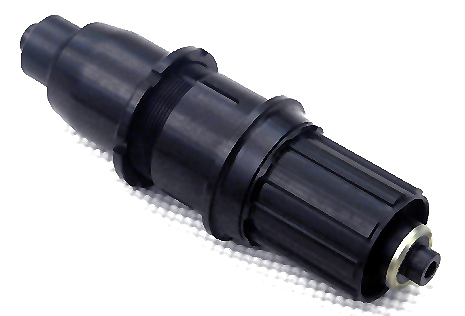 The older style hub is identified by its silver axle end caps, the newer hub (C2K) by its black axle end caps and gold drive side serrated ring -- see image above. The C2K rear hub weighs 218 grams. It is light weight, tough, reliable and easily serviced. The bearings are the highest quality stainless steel sealed cartridge style. The hub shell and lock ring are high temper aircraft aluminum alloy. The axle is a stiff oversized alloy design. The clutch mechanism is an 18 point ratchet clutch that drives very fast and positive engagement. The drive side dropout contact is steel for secure grip. The cassette body is alloy. Our hub is available in a Shimano 8/9/10 speed style spline or Campy 9/10 style spline pattern. Our rear hub comes in a 100% Shimano compatible option that fits 8, 9 and 10 speed Shimano cassettes. Our rear hub also comes in a 100% Campy compatible option, that mates with Campy 8, 9 and 10 speed cassettes. Both Shimano and Campy options are also available as a retro fit kits (rotor and end cap) for any CROSSWIND or FLY rear hubs or CROSSWIND or FLY rear wheels purchased as of June 2000. Call us, or e-mail to order any upgrade or retro fit parts kit (see contact us). We also offer modest prices for servicing hubs. Any CROSSWIND wheel can be reconfigured by replacing hubs, also see our other interchangeable hubs (front, track, and handcycle). Also see installation instructions. Also see hub comparisons, rear hub assembly and pricing. All Pages Copyright © 1997 - 2006 Nimble LLC. All rights reserved.